Known from tropical eastern Australia, eastern Papua New Guinea, and Fiji. Pelorus Is., North Queensland, Feb 1985. One of a group of white species of Halgerda with orange markings. This species is characterised by the orange-tipped tubercles and the large orange patches on the dorsum between the tubercles. There is also a thin orange mantle border. Other similar coloured species include Halgerda carlsoni, Halgerda sp. 1 and Halgerda malesso. • Willan, R.C. & Brodie, G.D. (1989). 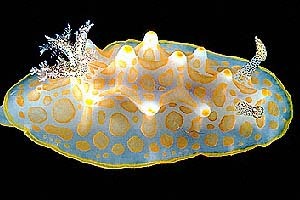 The nudibranch Halgerda aurantiomaculata (Allan, 1932) (Doridoidea: Dorididae) in Fijian waters. The Veliger, 32(1): 69-80.